Fiumara of Tusa is the bed of an old river, that a long time ago flowed among the Nebrodi mountains for twenty-one kilometers till the ancient Hales, a dry river that only in winter becomes a torrent in a landscape that alternates stony desolation and stretches of luxuriant vegetation, and where, if you climb up the big mountains, offers a remarkable views. The idea of “Fiumara d’Arte” started on 1982 when the sudden death of his father forced Antonio Presti to interrupt his engineering studies and to go back to Tusa to manage his father’s cement company. 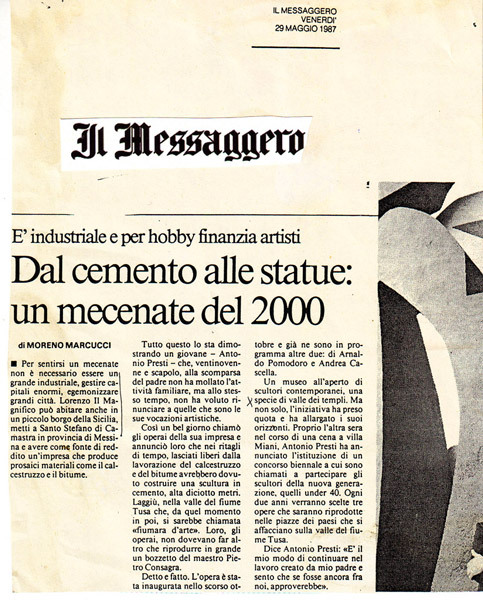 Presti, who already collected contemporary art, burdened with responsibilities and shaken by his loss and the impact with death, thought to dedicate a monument to the memory of his father. 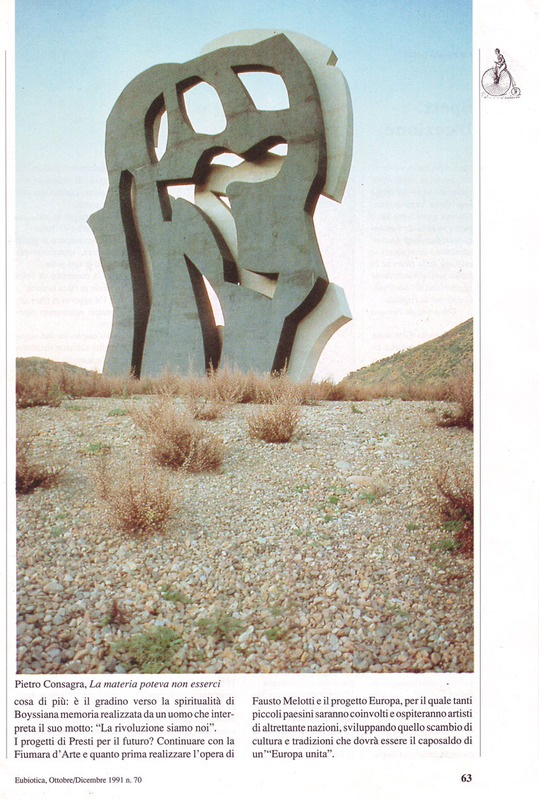 For this reason asked Pietro Consagra to realize a sculpture. 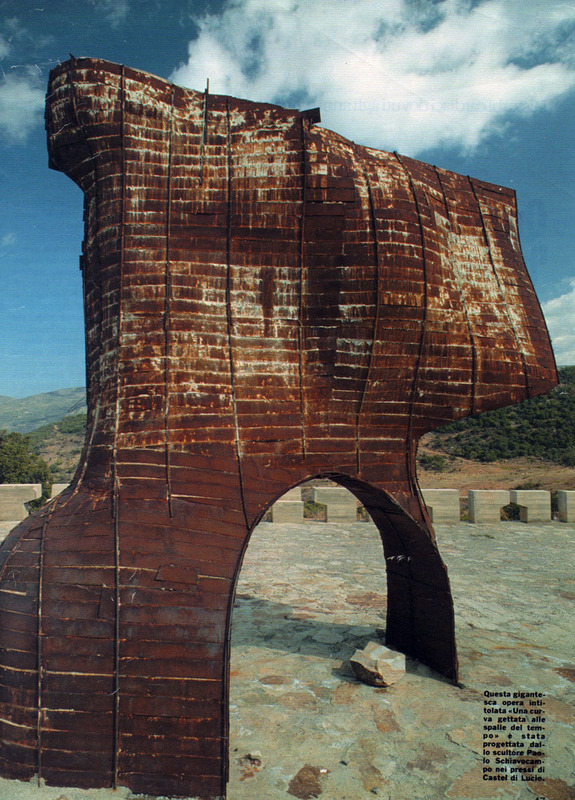 He thought to make not a merely private matter, something to locate in his own garden, but to donate the sculpture to the community and he thought of place it at the mouth of the river. 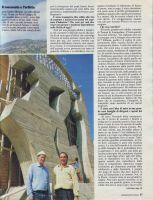 Soon the project changed, and becomes large. 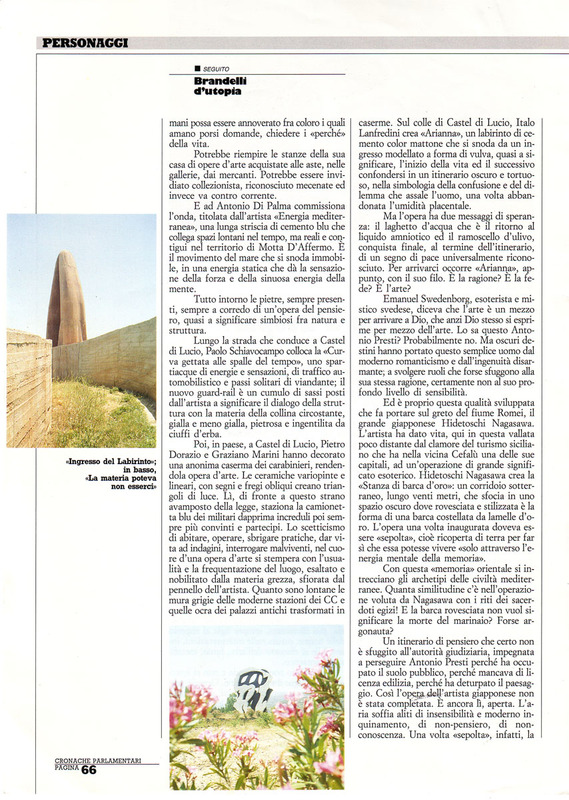 Antonio Presti thinks to create a park of sculptures blending the contemporary with the rugged beauty of the place. 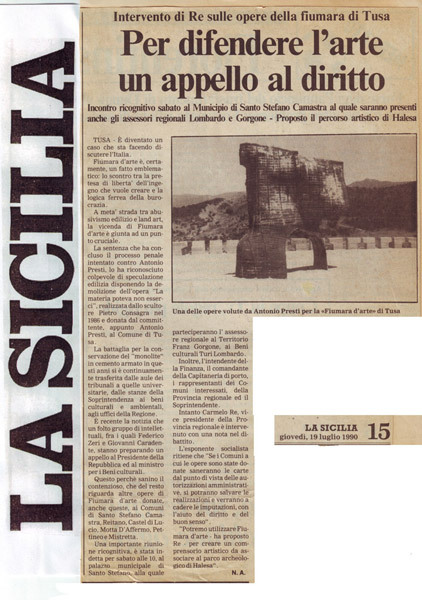 The inauguration of Consagra’s sculpture, on 12 October 1986, coincided with the announcement of the open-air museum, with the consensus of the mayors of the area. 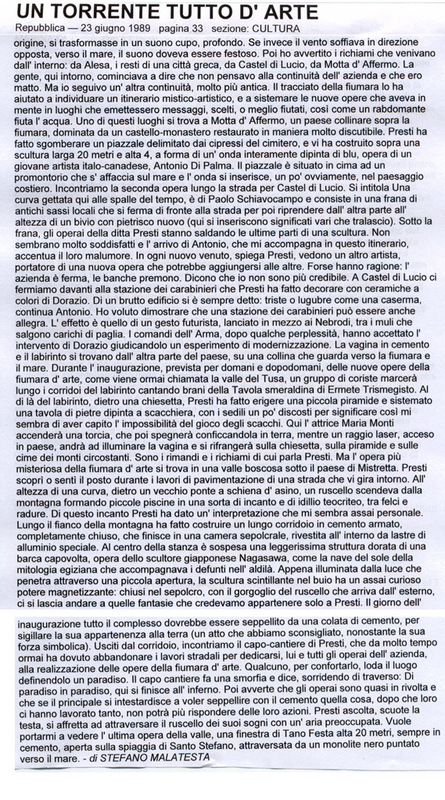 However, as a precaution, the Mayor of Tusa, after received a report from the Superintendent of public works of Messina, sent an order to suspend the work. 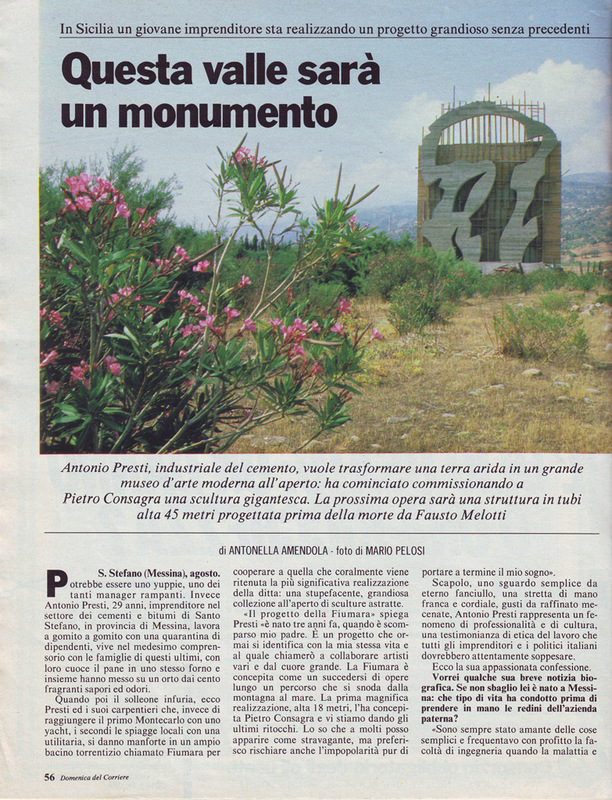 Meanwhile Presti had already contacted another sculptor, Paolo Schiavocampo, from whom he commissioned a sculpture to place at the junction of the road leading to Castel di Lucio and an old country road, and he presents it as an urban feature to the project for remaking the road for which his firm had a contract. 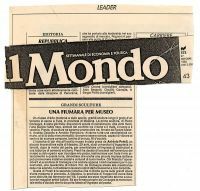 He also involved the painter Tano Festa: during a visit to his laboratory in Rome, he discovered his sketch of Monument to a Dead Poet (Monumento per un poeta morto), dedicated to his brother Francesco Lo Savio. 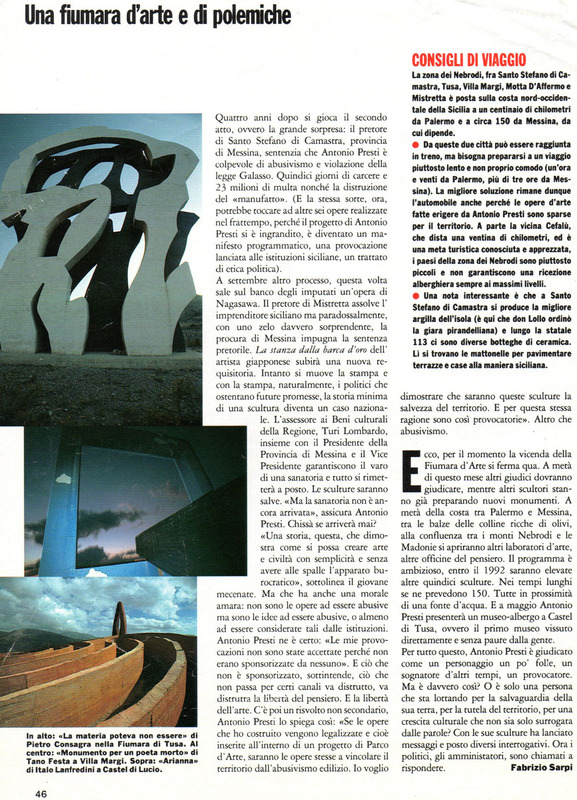 Tano Festa decided to realize the sculpture in a monumental size on the seafront at Margi, with the enthusiasm of the artist, already sick and the approval of the council of Reitano, which with a deliberation authorized the construction because of the renown of the artists and the boosting of the territory with a work entirely at the expense of the proposing. 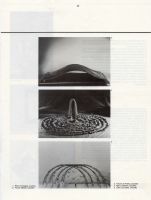 Schiavocampo’s work had a fascinating title. 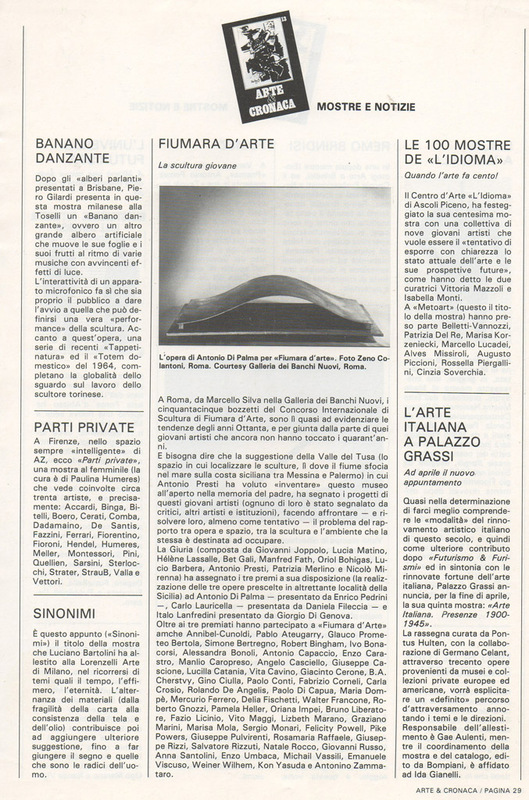 A Curve Thrown at the Back of Time [Una curva gettata alle spalle del tempo] on 30 January 1988, at the same time as a sculpture competition for artists aged under forty organized by Presti, who got together an international jury. 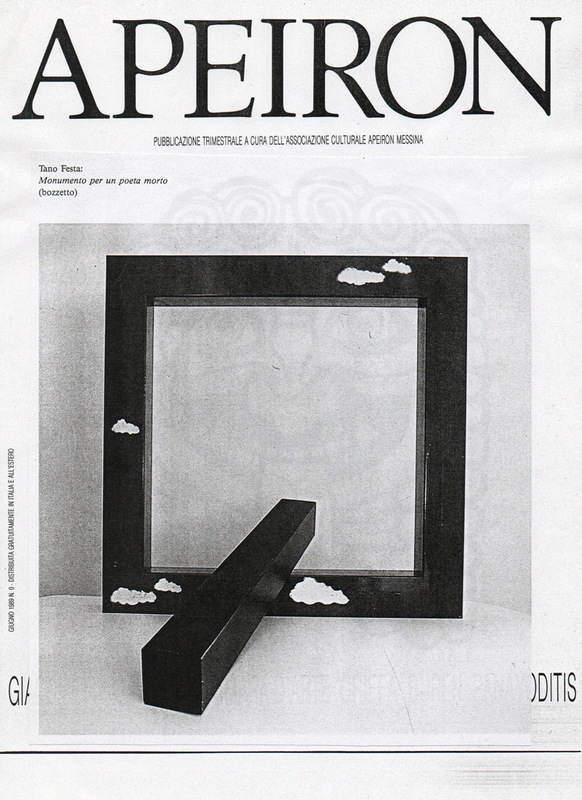 Fifty-five sketches were submitted. 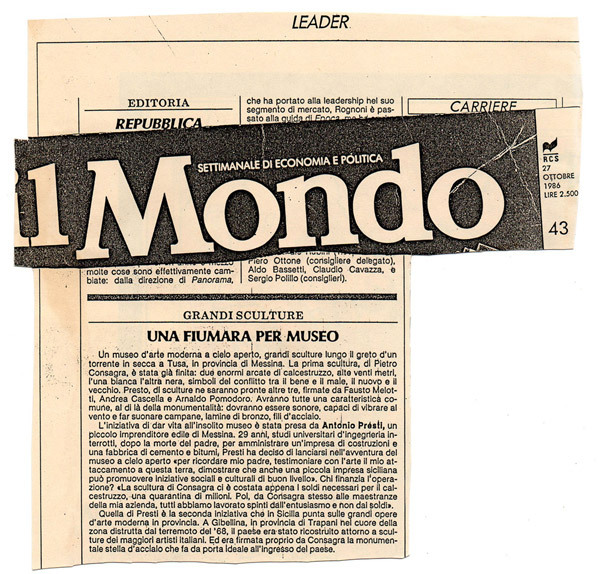 The ones chosen were those of Antonio Di Palma (Florence) and Italo Lanfredini (Mantova). 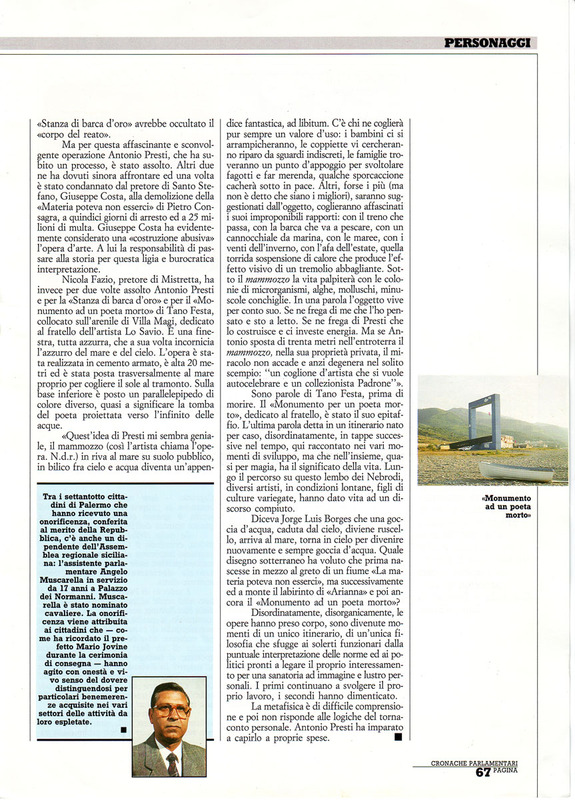 Festa’s work, re-titled Window on the Sea [Finestra sul mare] was inaugurated on 24 June 1989 (the artist had died the year before), together with Nagasawa’s work on the Romei Torrent, Mediterranean Energy [Energia mediterranea] by Antonio Di Palma and Ariadne’s Labyrinth [Labirinto di Arianna] by Lanfredini. 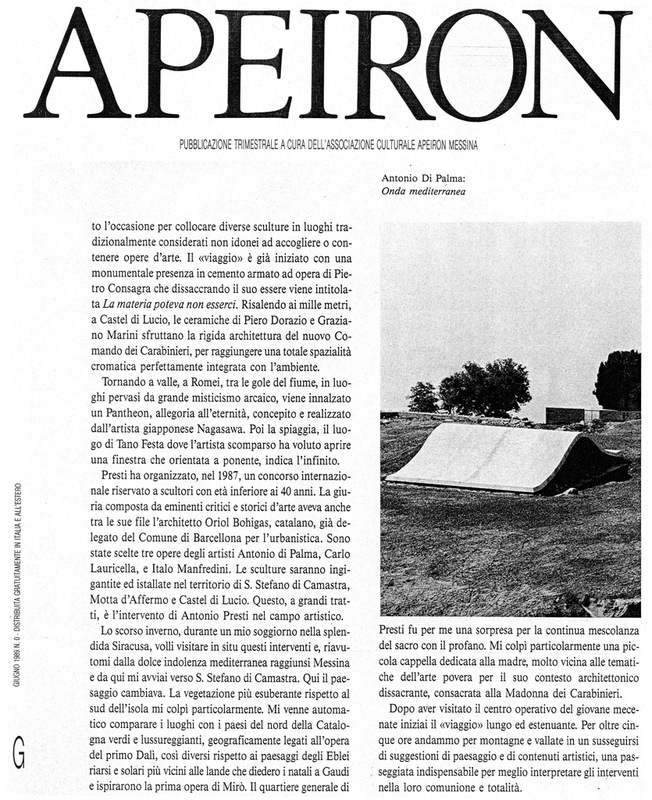 At the same year Arethusa, the very colourful ceramic decoration of the carabinieri barracks of Castel di Lucio done by Piero Dorazio and Graziano Marini, had already been completed. 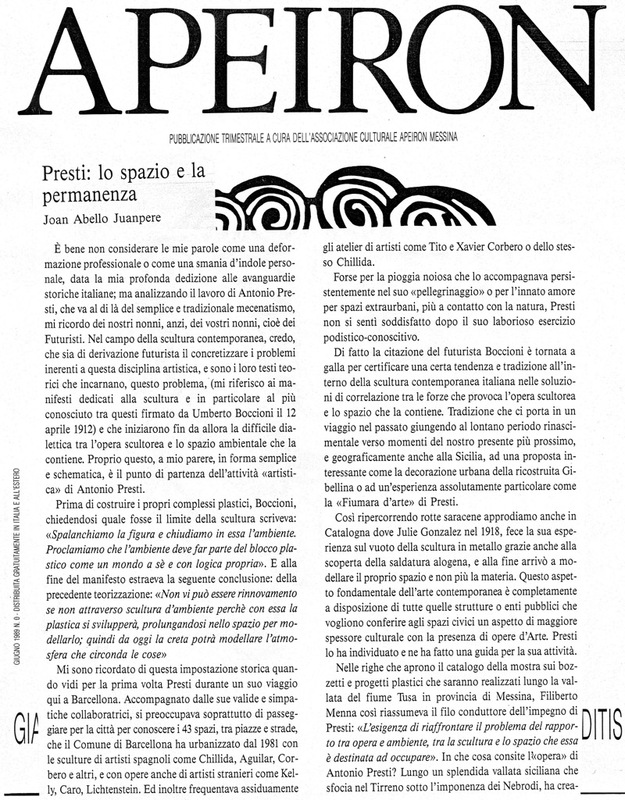 However, the overall baptism of Fiumara d’Arte paradoxically coincided with its arrest: The impounding of The room of the golden boat during its inauguration and on the same day an ordinance also came against Window on the sea due to occupation of the maritime demesne and unauthorized building. 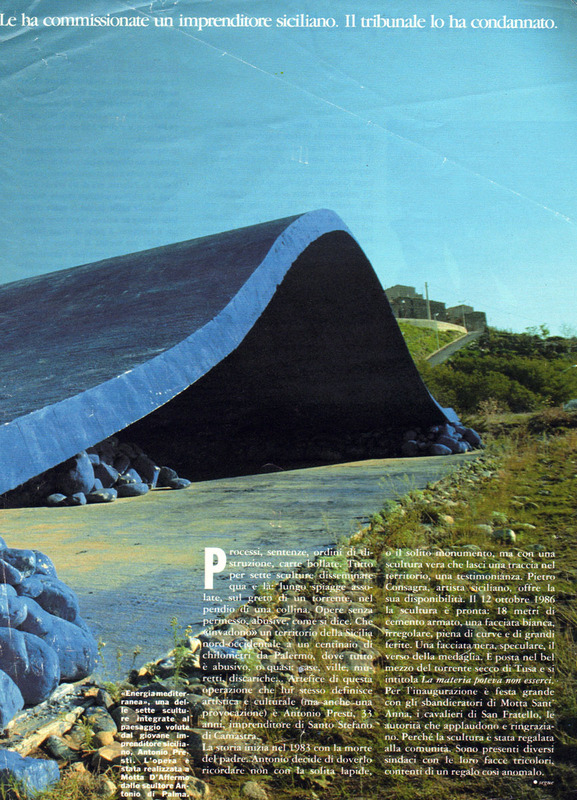 Five judiciary actions were set against the Fiumara works and the intricate legal business began, that stopped the completion of the park, which should also have involved the realization of art works by major artists like Eduardo Chillida, Fausto Melotti and Arnaldo Pomodoro. 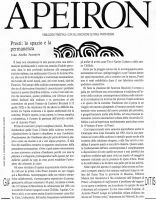 The mayors withdrew their support and Presti was left alone to face the law, although the press and the world of art were on his side. 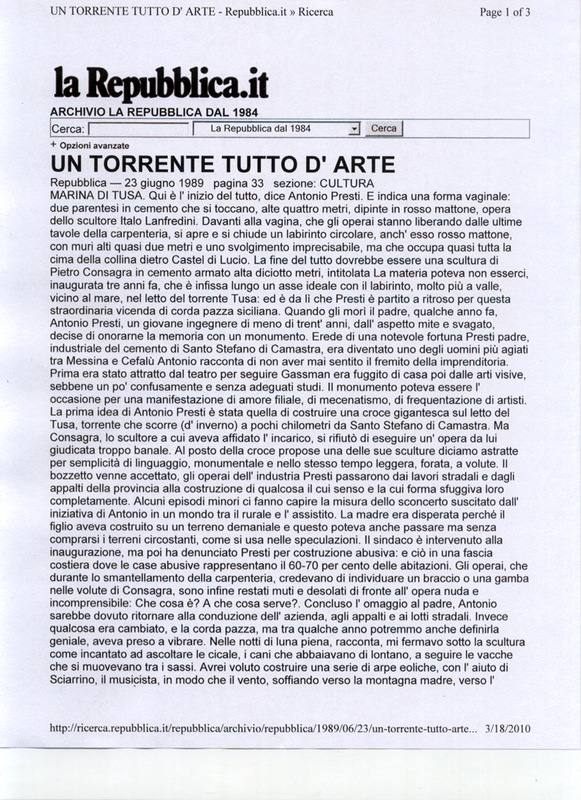 There was also a inquiry in Parliament, signed by Bruno Zevi, Giuseppe Calderini, Massimo Teodori, and Francesco Rutelli, who asked the Minister for the cultural and Environmental Heritage to “act with a major urgency to stop the attack and persecution by the local institution to Antonio Presti, who has built up around the Tusa torrent, a new and exceptional artistic, cultural and landscape area of international interest”. 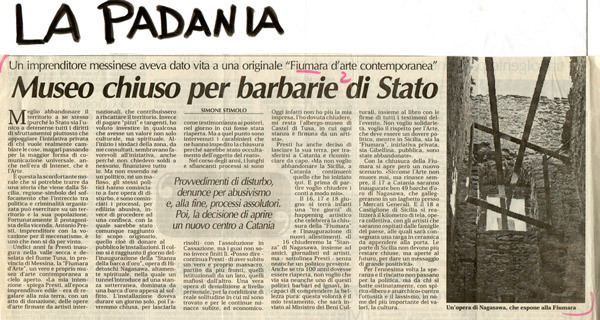 Lombardo appointed a commission to study the way in which to defining the Fiumara an institutional occasion of the Sicilian Region for the promotion of art, and promised rapidly to pass a regional decree-law. 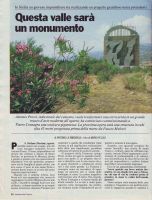 Hence a clash began between administrators and judges, and the heart of the matter became less and less juridical and more and more political, while it was officially agreed that the Fiumara works did not disfigure but they “healed” the disfigurement of the landscape perpetrated in the previous decades, despite the unfavourable opinion of the Messina Superintendence, which remained adamant in its hostility. But, despite the good intentions, the political action led to nothing concrete and soon the curtain fell. On 10 October 1990 the magistrate of Mistretta, Nicolo’ Fazio, acquitted Presti for Golden Boart Room with an interesting sentence that demonstrated how cultural sensitivity can filter the regulations set up to protect the citizen with that particular evolutionary interpretation that writes the history of jurisprudence: the action did not constitute a crime, because the room hidden in the clay did not alter the state of the places seen as an identity; there was no damage to the beauty of the landscape, as beauty was metaphysical datum that it was difficult to define; the Galasso Law was not applicable in that Fiumara d’Arte ”proposes an artistic amelioration and not the town planning and building transformation of the rough district of the Nebrodi”. 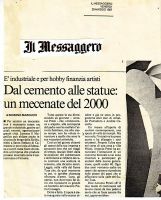 But the Messina prosecutor’s office appealed, subsequently unifying the various ongoing legal actions against Presti. 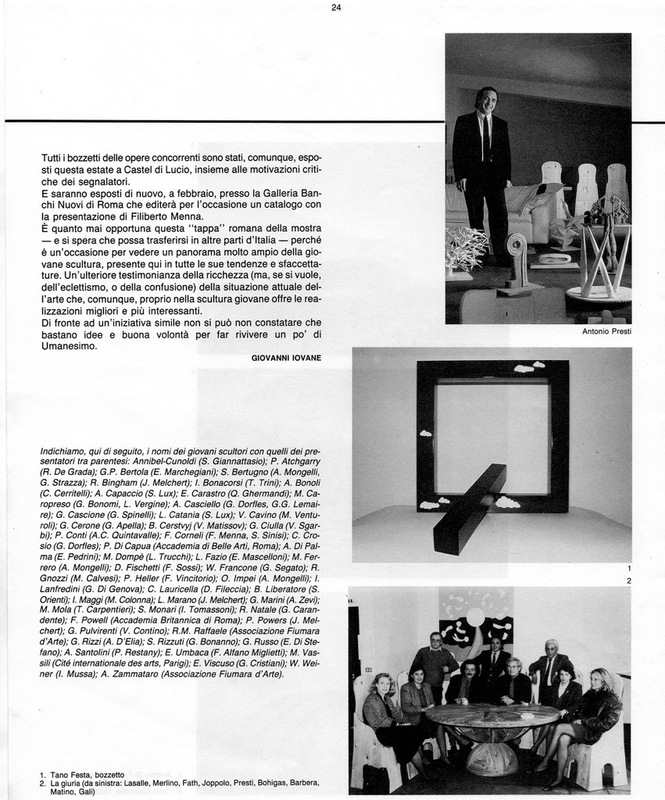 Meanwhile in 1991 Presti inaugurated Atelier sul Mare, a hotel at Castel di Tusa, entrusting various artists with doing the rooms. 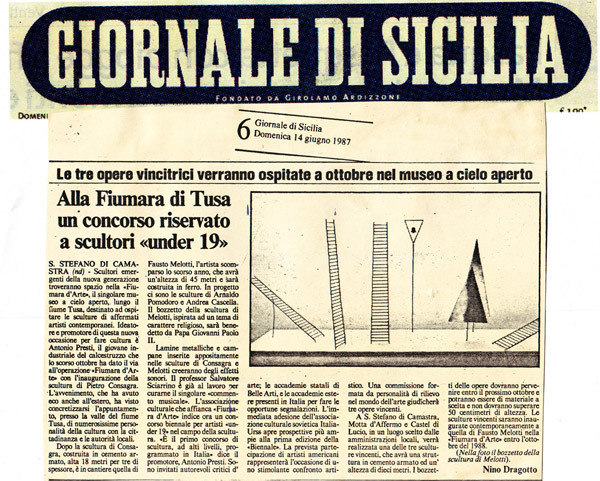 The hotel soon became a peculiar museum that people could live in, a starting point for excursions in the Fiumara, a residence for young foreigner artists and an exhibition space for Sicilian artists in the following years. 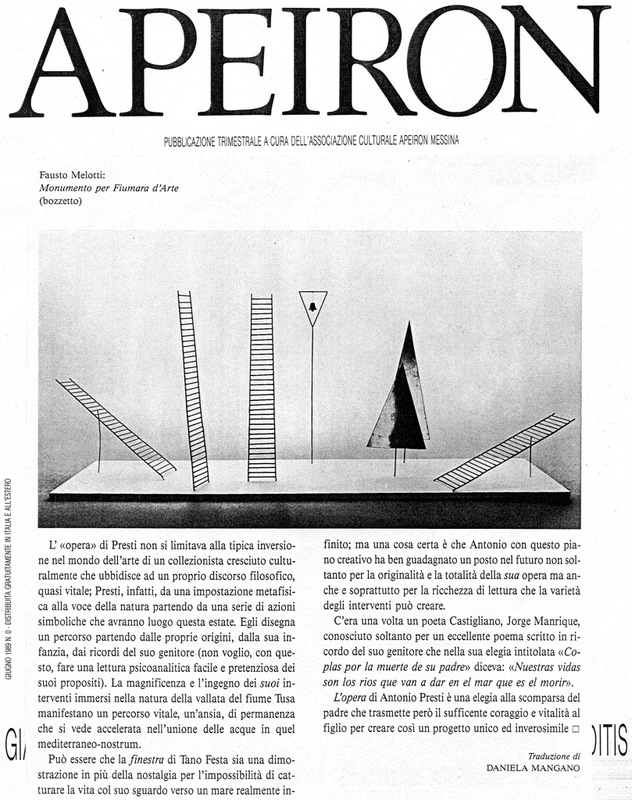 The history of this fascinating hotel, in which every art work becomes its own temporary dwelling, though linked to the extraordinary development of Fiumara, constituting a sort of hermitage of pilgrims of art. 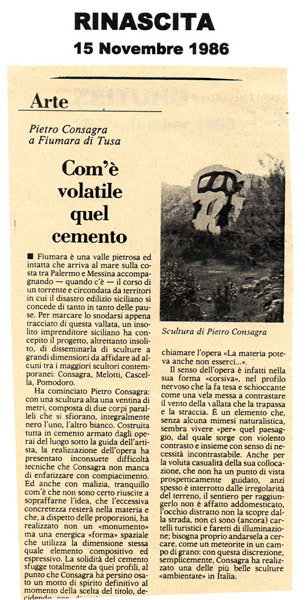 On 1991, in one of the Fiumara villages, Pettineo, the tireless Maecenas also organized the singular event called A kilometer of canvas [Un chilometro di tela], an expontaneous exhibition of paintings on canvas going through the streets of the village, to be afterwards cut up and donated to the inhabitants, whose homes became “domestic museum”. 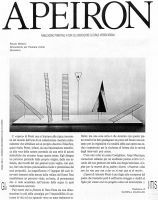 Two hundred artists arrive, well-known and not so well-known, and the kermesse was repeated in the subsequent years. More over, there was no peace from the law. 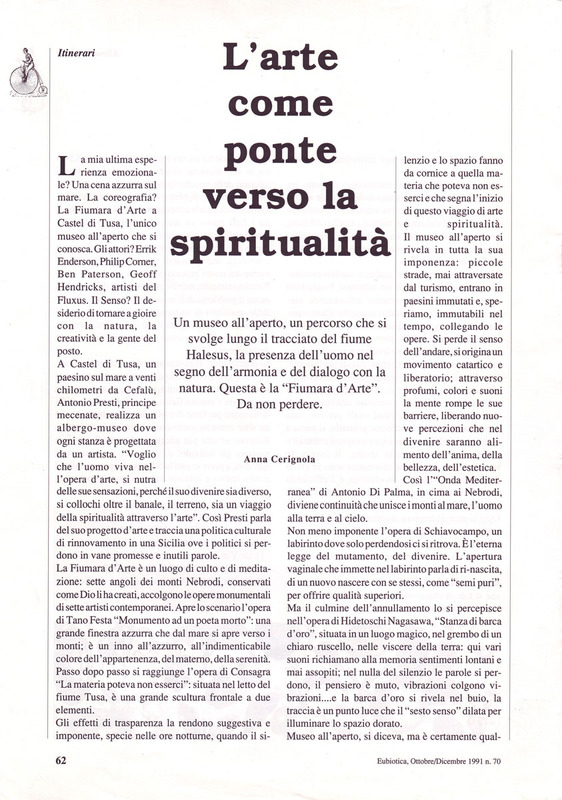 It is true that in 1993 the film The clandestine journey - Lives of saints and sinners [Il viaggio clandestino. 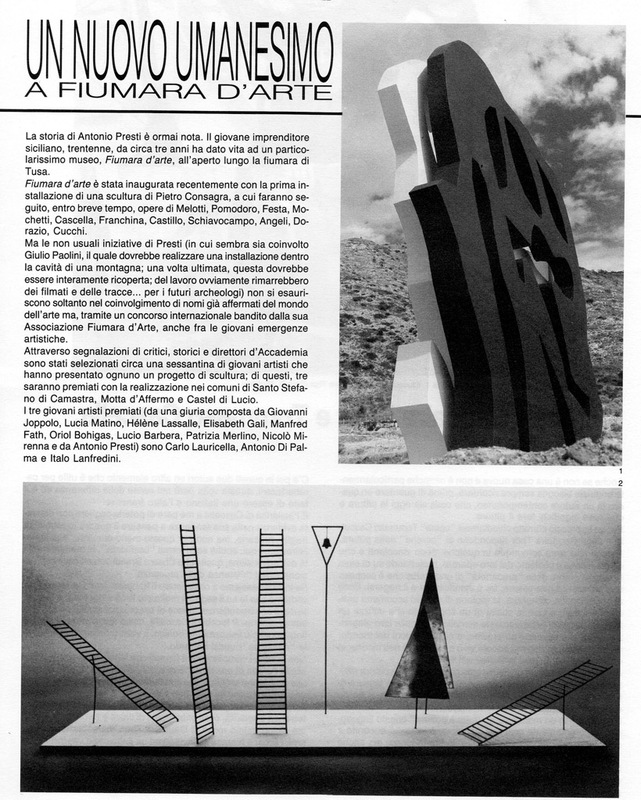 Vite di santi e di peccatori] was made among the Fiumara sculptures by Raùl Ruiz, a Chilean director who was a sort of avant-garde myth and also designed one of the hotel rooms, Life is a stone dream [La vita è un sogno di pietra]. 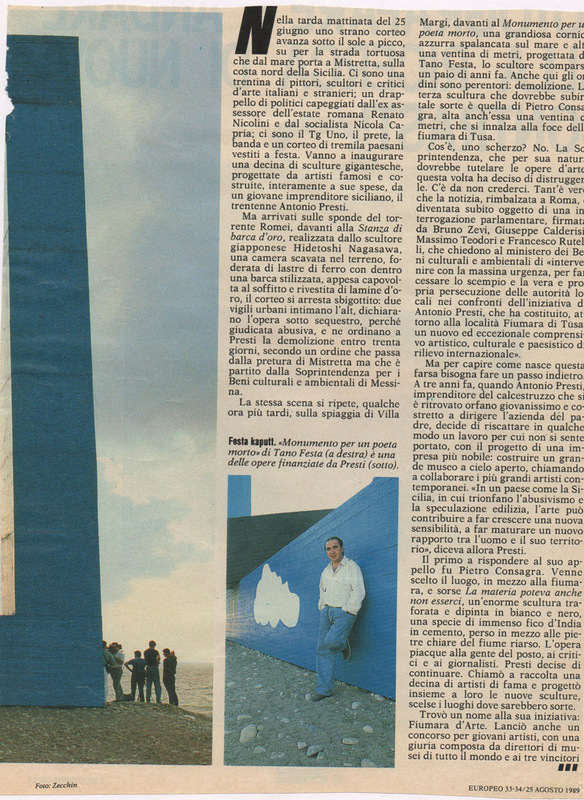 It is also true that in October of the same year Presti invited forty young ceramists from all over Europe to do a collective work on the containment wall of a Fiumara road, which thus became The wall of life [Il muro della vita]. 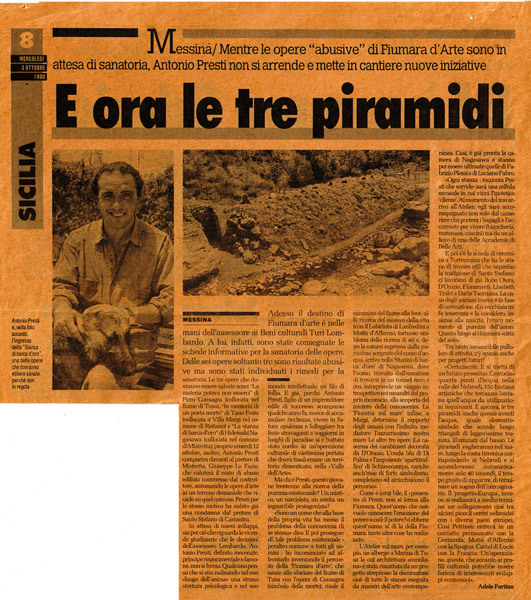 However, on 25 October 1993 there came the harsh sentence from the Messina Appeal Court. 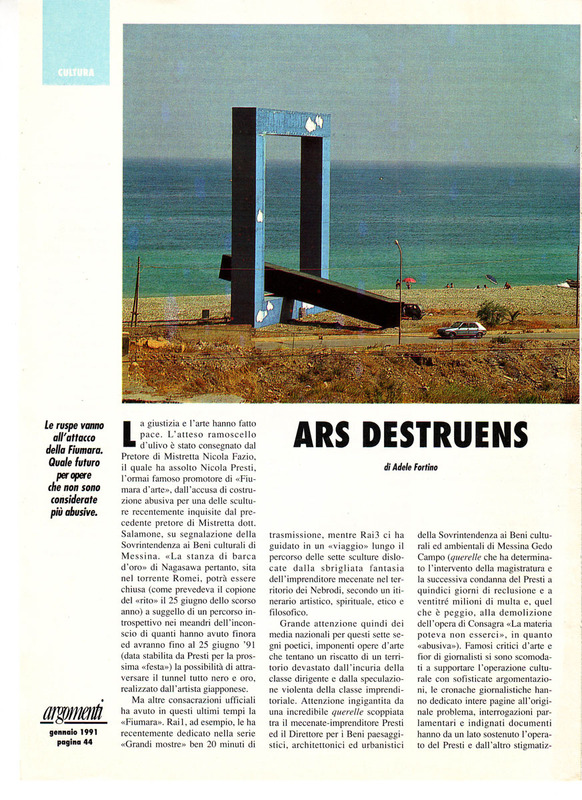 The order came to demolish Window on the sea, considered an unauthorized building exactly like the 15,000 unlicensed buildings that instead a regional law voted in that period by the Campione government, but stopped by the Regional Administrative Tribunal, was about to save. 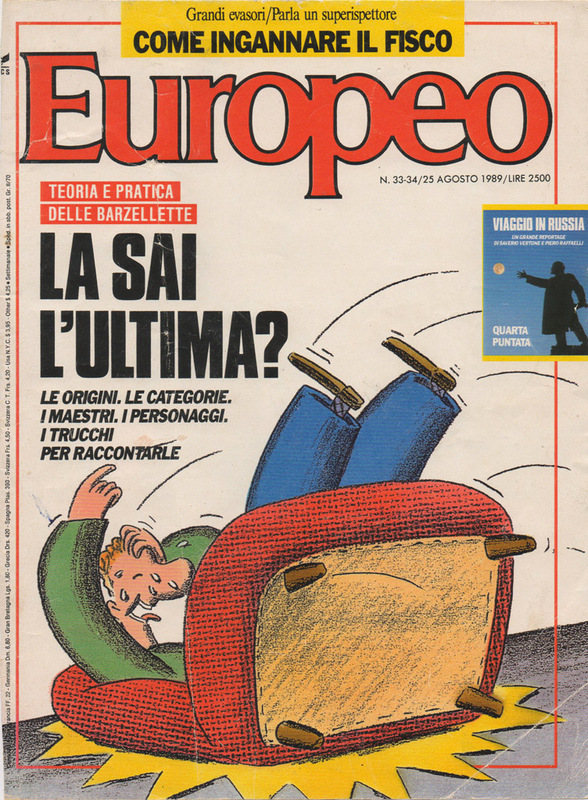 Presti was also sentenced for A curve at the back of time with two weeks’ arrest, 15 million of penalty and a fine of 30 million lire. 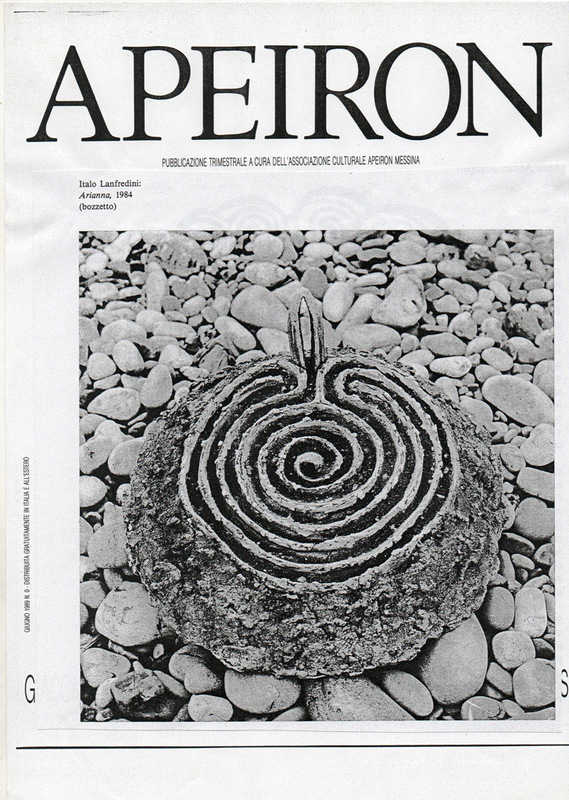 Instead, the legal actions against the other three works, Golden Boat Room, Mediterranean Energy and Ariadne’s Labyrinth were declared to have been prescribed. 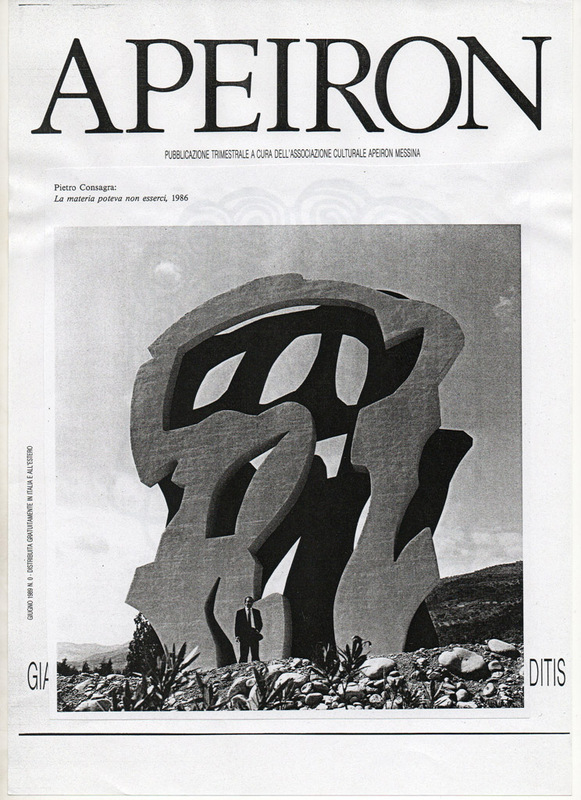 This was the time of a second wave of general mobilization and at once in Rome a group of artists and intellectuals pressed for intervention by the Minister for the Cultural Heritage Alberto Ronchey, while a petition signed by 60 exponents of Italian culture exhorted the regional government to act to avoid demolition. 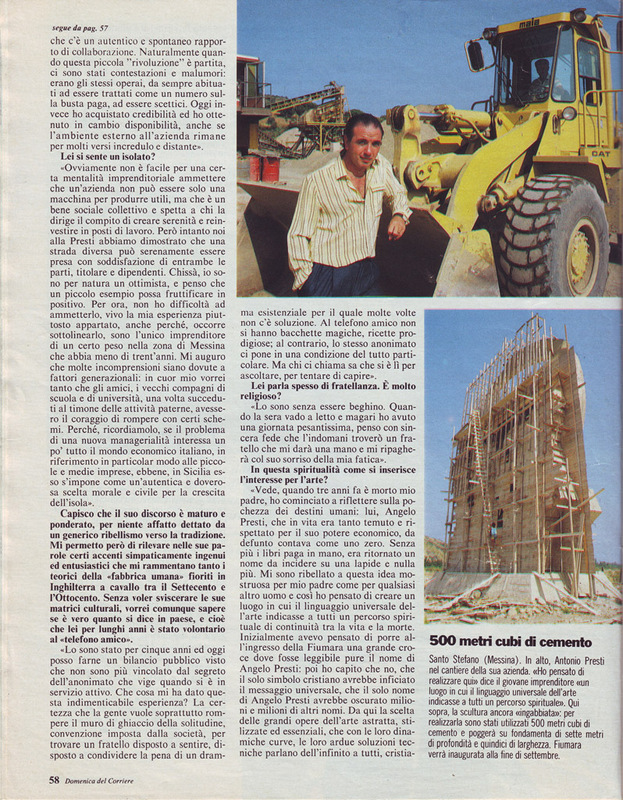 Besides, there was a handy solution: according to the new regional law an unauthorized building demolition could be avoided if the town council declared the prevailing public interests, and in the case of Festa’s work these interests was evident. 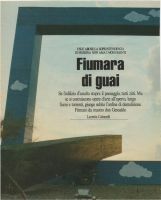 But the town council was unwilling to be involved, and in the meantime the Social Democrat group at the Regional Assembly prepared a government bill for Fiumara. 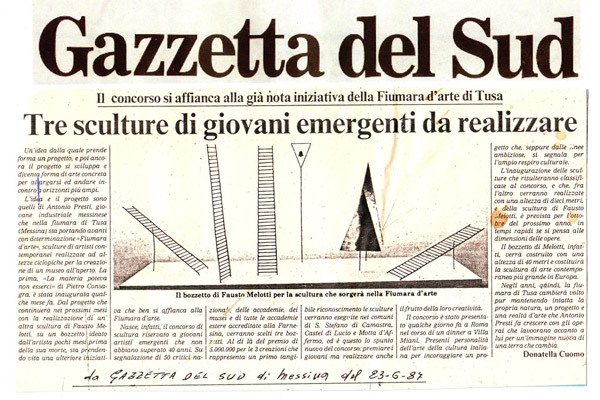 In the middle of November a document signed by 3000 exponents of culture and public opinion induced the Regional Minister for the Cultural and Environmental Heritage Saraceno to convene a meeting which seemed to introduce the official investiture of the government in the Fiumara business. 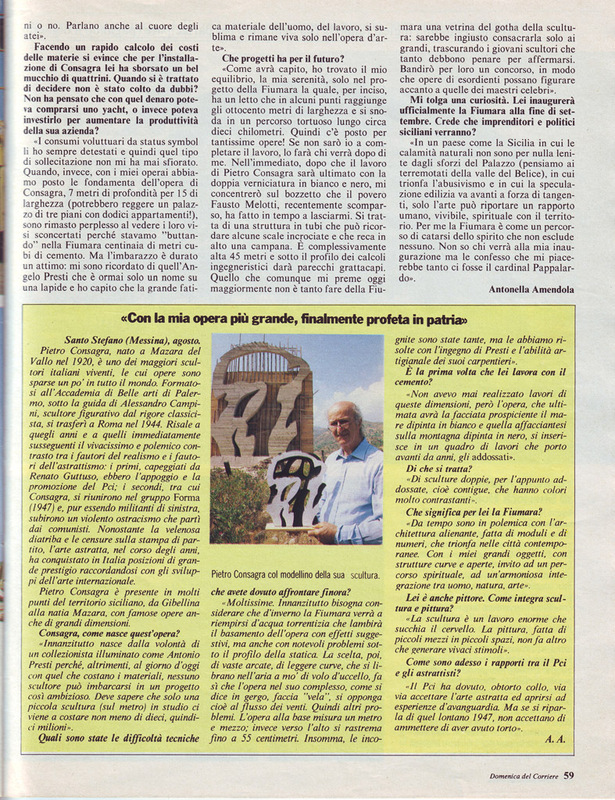 In the Yellow Room at the Norman Palace in Palermo, arrived artists, poets and art scholars from all over Italy to ask for Festa’s sculpture salvation. 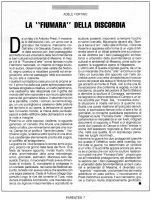 But even this time nothing happened and only Presti’s appeal to the Court of Cassation postponed the announced demolition. 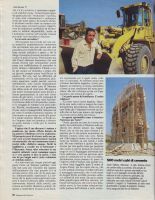 On 23 February of the same year, the Court of Cassation put an end to the matter by annulling the demolition order, the measures taken by the Appeals Court and the requests from the Messina prosecutor’s office. 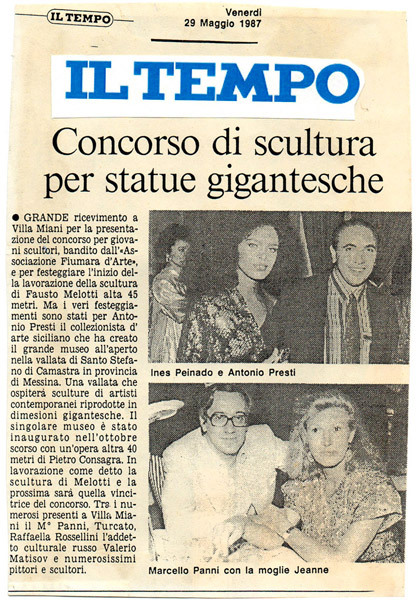 At the hotel-museum the celebration consisted in opening eight new rooms by artists. 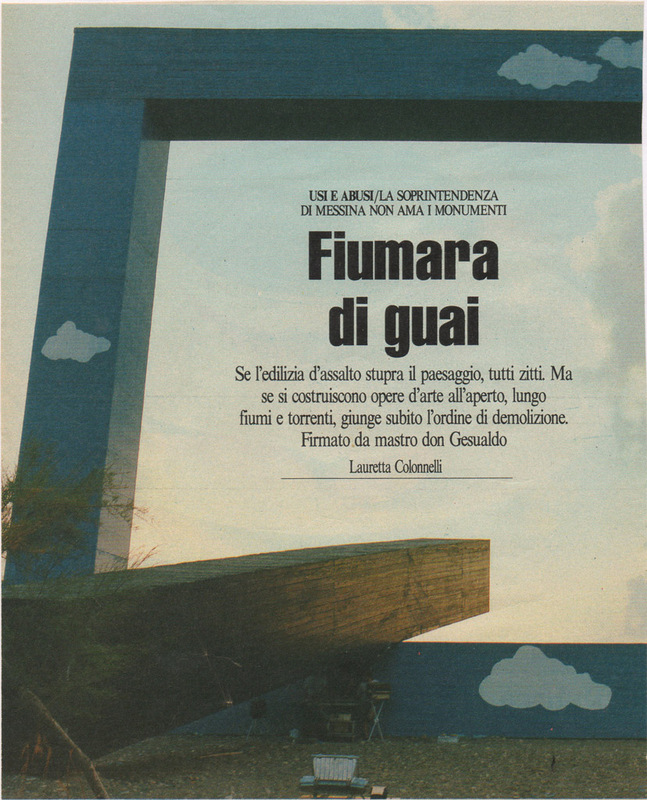 The Fiumara (and the Window) are safe. Safe? 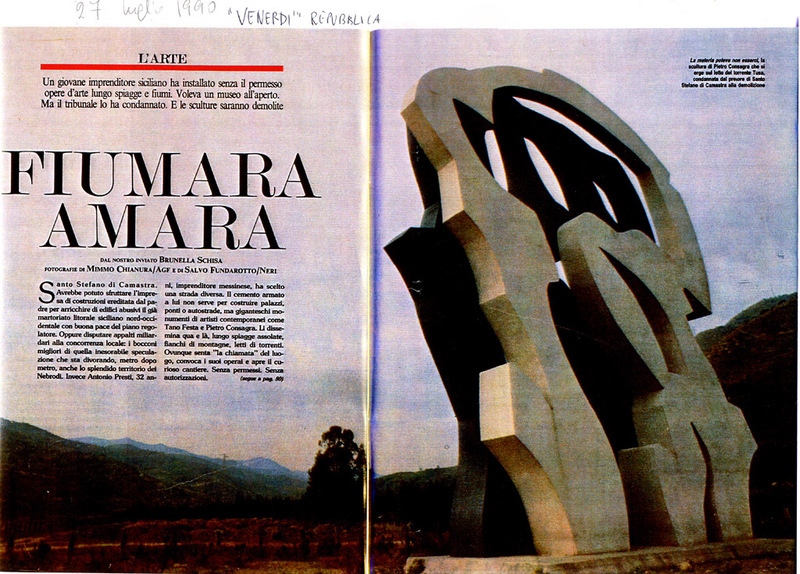 The Regional Government, the Provincial Government and the town’s councils didn’t recognize Fiumara existence. 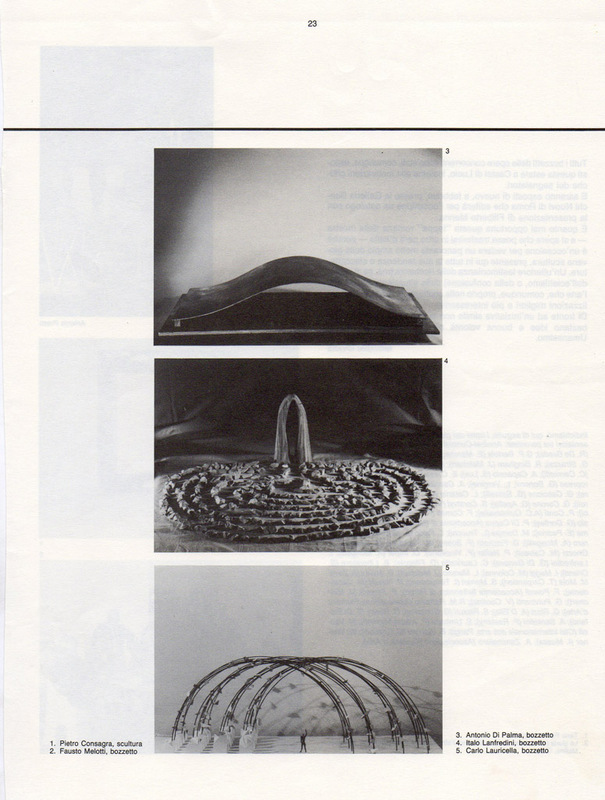 No one accepted the gift and undertook to safeguard it. 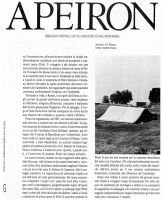 No one adopted it, leaving it an orphan at the mercy of degradation. 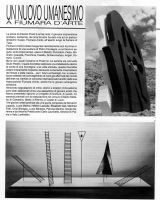 It doesn’t matter: fully visible but clandestine, the sculptures of Fiumara remain the privileged destination of an initiatory journey. 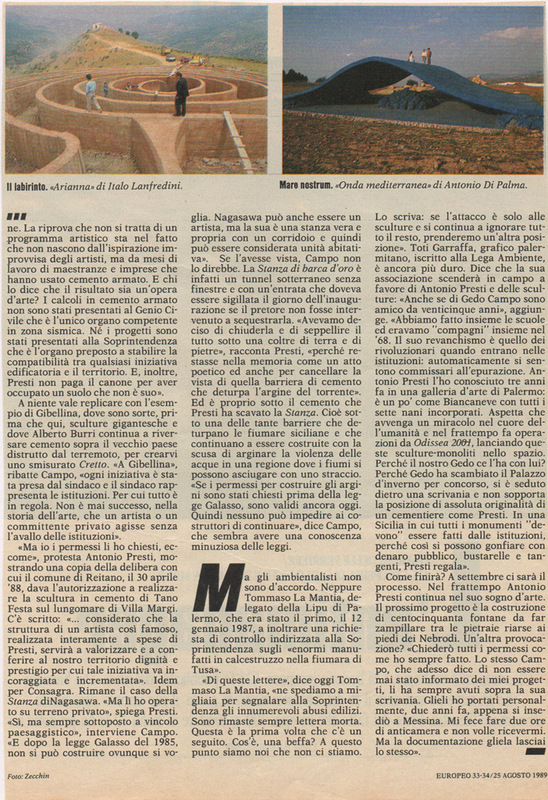 Presti, always isolated, victim of mafia attacks, decides to continue his civil commitment in Catania for the suburbs of Librino and in Palermo for the Oreto river. 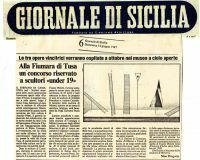 On 2005, when he realizes that all his artistic patrimony is deteriorated and the maintenance of the sculptures is indispensable, on 22 April decides to oppose a refusal to the refusal of the Institutions and closes the Window on the sea with an enormous blue cloth with the inscription “closed” translated in various languages. 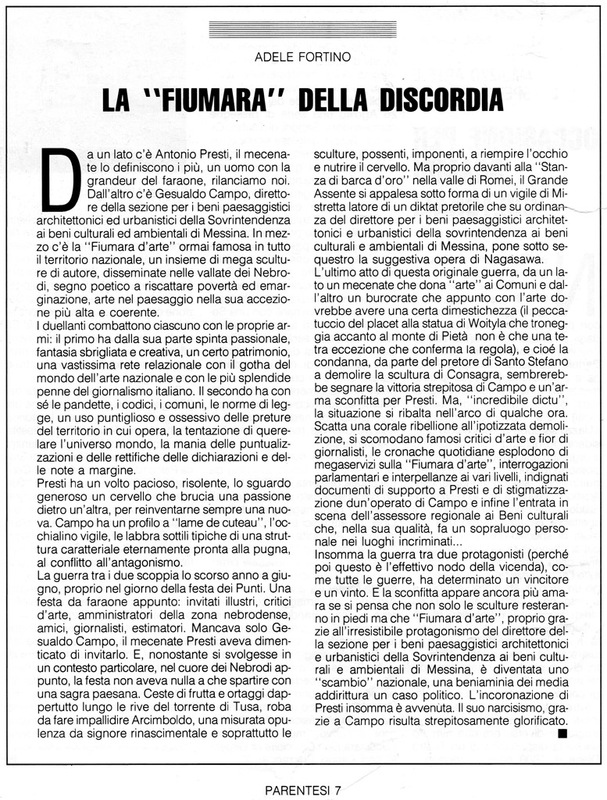 Presti said: "there are men who in the life have the joy to open windows on the sea, but those men have the power to close them." With this symbolic gesture Presti decides to reverse the positions: remove the art work from the public sight is a gesture of great force in order to assert the existence of the sculpture like thought, apart from the matter. 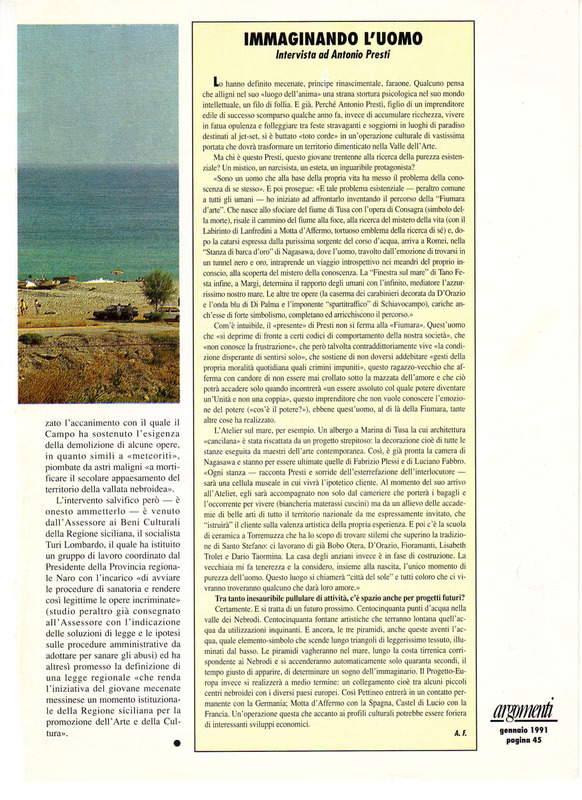 This time is Presti to inform against all the mayors and the Sicilian Region for civil safety. 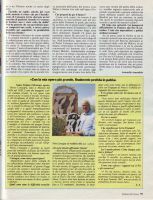 The president of the Republic Carlo Azeglio Ciampi takes part to the appeal, and finally, on 6 January 2006, after 25 years of battles, the Park of Fiumara d’Arte is recognizes, helped by the regional Government who has approved the institution of the cultural and tourist distance of Fiumara d' Arte (Regional Law 6/06 titled "tourist-enjoyment valorization and conservation sculptures of Fiumara d' Arte" signed by On.le Nino Beninati and by On.le But Fleres). The word "end" of this vicissitude, seals not only the commitment of a life, but it asserts, above all, a political success of the art, the victory of the force of the existence.